Do you want to travel the world, but aren’t sure how to make money while doing so? 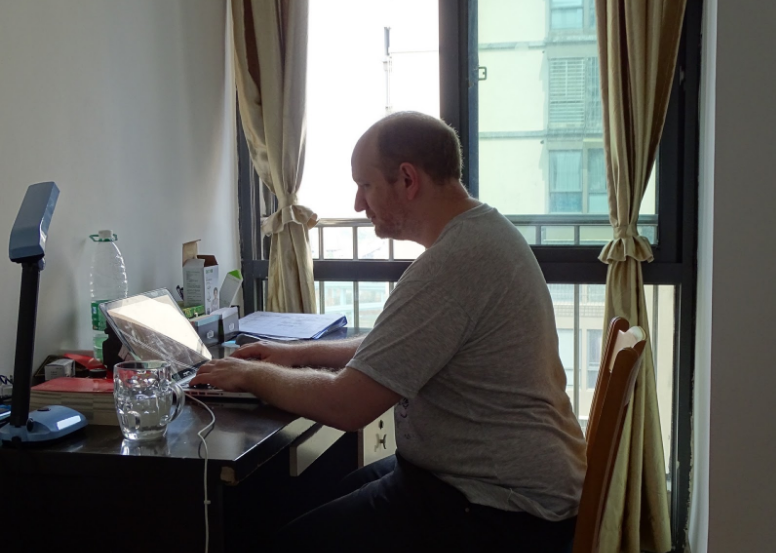 In this week’s article, we have an interview from Chris Behrsin who shares about his experience working as a copywriter around the world. That’s right! Chris figured out how to get paid to write online. 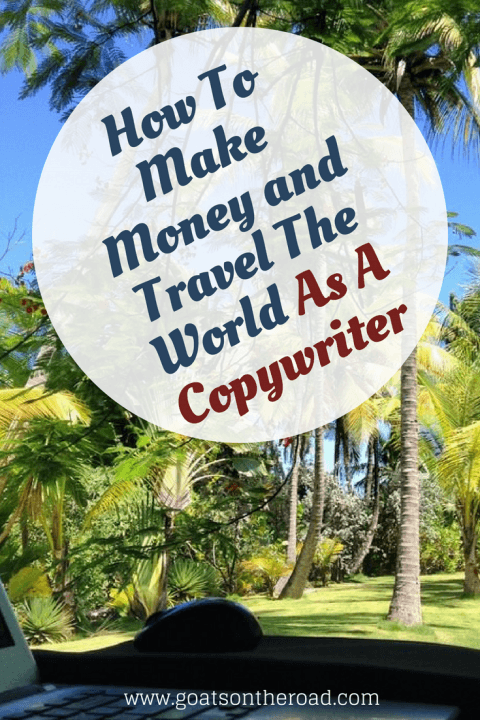 There are numerous travel jobs and fun online jobs you can do, but if you’re wondering how to make money online as a copywriter, how much money you can make by working as a copywriter, how to find a job, what the job entails, and what the pros & cons are…read on! I’m Chris Behrsin and I’ve done a variety of jobs over the years. I’ve been a software developer, a teacher (teaching English as a second language), a telemarketer, and a technical author among other things. But my one gripe with every job I’ve taken so far is how they tend to get me stuck in one place. Particularly as a software developer, my London employer gave me four weeks’ holiday, plus public holidays, which only gave me four weeks of travel time each year. This just didn’t feel enough time to get out there and see the world. But this year, I discovered UpWork. I’m now a copywriter and this is the job I’ll be covering today. I learnt how to use the writing expertise that I’ve developed over the years to get copywriting gigs. Now, whenever I need money, I can log in and send off proposals until well-paying work comes my way. Copywriting is a pretty broad term and there’s a lot of debate on its definition. But you can think of it as simply writing promotional and advertising material for businesses. The internet has become such a phenomenon that companies need writing more than ever. Even large corporations sometimes have a demand for good writing that they need fast. That’s when they go in search of freelancers. Many of them will go to a freelancing platform, such as the huge UpWork network. There’s plenty of decent work there if you’re willing to wade through the spam. Personally, I specialize in writing explainer video scripts. You’ve probably seen these on Facebook or YouTube – 30 to 90 second advertising scripts that market a company’s product or service, often with a cartoon in the background. But I’ve written other stuff as well. One client wanted me to write a set of Celtic mythological short stories to include in the packaging of his jewelry range. Another wanted a riddle (unfortunately I can’t tell you what for, I signed an NDA). Other copywriters write sales letters. These are the long pitches that, for example, you read before signing up to an internet course. They pay big money – up to tens-of-thousands of dollars, in fact. Also, if you have technical background in something, there’s good money to be earned writing White Papers. An eight-to-ten-page explanatory document can pay thousands. 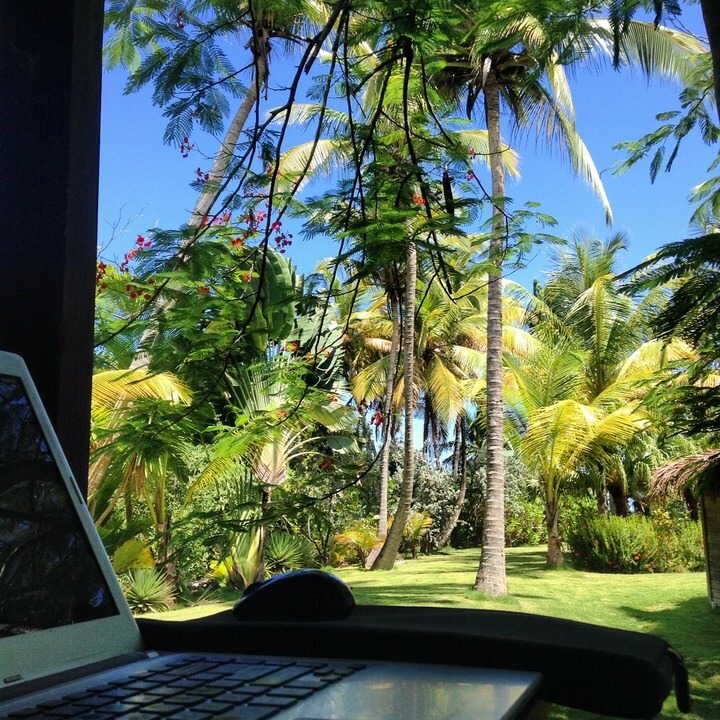 I love copywriting because I can set my own hours and take the work with me on my travels. It really does allow for a flexible lifestyle. I kind of fell into this by accident, to be honest. Or, if you like, through necessity. You see, my wife and I were having visa problems in our teaching job in China. One ruthless staff member in our previous job wouldn’t release the documents we needed to get a work permit for our next one. We managed eventually to get the papers through sheer diplomacy. But they were too late coming and we had to take a couple of weeks unpaid leave in Vietnam to get things sorted. At that time, we didn’t know 100% if we’d be able to return to China. So, we needed a backup plan. We were in Hanoi, a digital nomad hub. 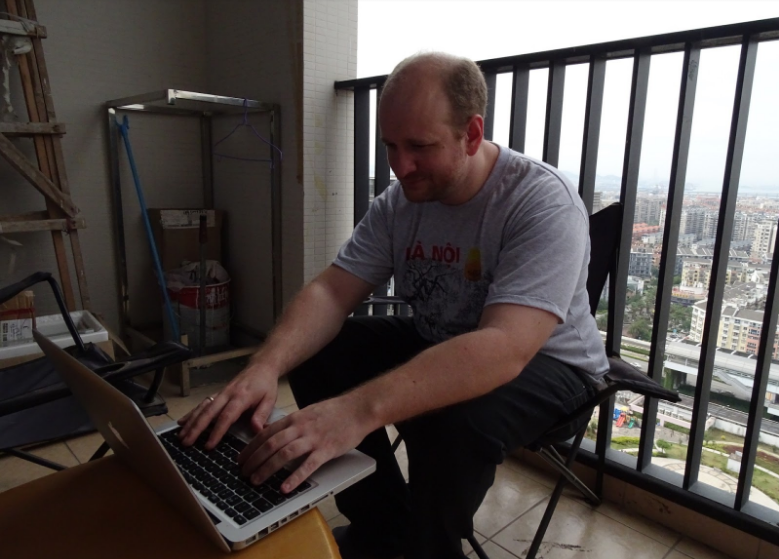 I can’t remember where I first heard the term ‘digital nomad’, but I started to research it on the internet from our AirBnB apartment near Hanoi’s Lotte building. Because we’d never been to Vietnam, we travelled during the day, saw the sites around Hanoi such as the West Lake, and the Trấn Quốc pagoda. In the evening, I continued my rigorous research. I read blog posts by digital nomads who claimed to be earning good money as a freelance copywriter. But I had no clue how to break in. 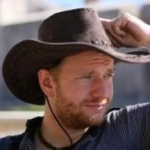 That was until I came across Danny Margulies website about how he used UpWork to make over $100,000 one year as a copywriter. 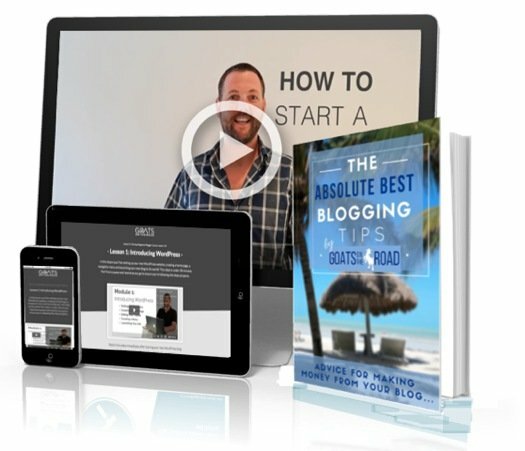 I signed up to his course, trying not to begrudge the cost, which taught me enough to start making a decent part-time income. So far, I’ve done this job in China, the UK (my home country), and Poland (my wife’s home country). It’s a completely mobile job and usually my clients are fascinated to hear how I take my work travelling with me. Some have even told me that they’re jealous. One note, if you do choose to do this job in a country with a firewall such as China, make sure you get good VPN software. Google is essential for research but it is usually blocked by China. A good VPN will circumvent this issue and allow you to use the internet as normal. I use ExpressVPN, which I’ve found the most reliable. 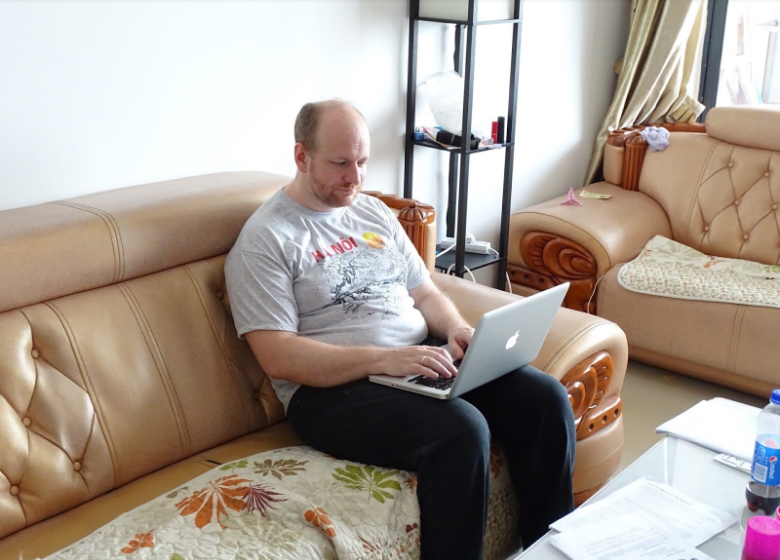 Most of my work, I’ve done from our three-bedroom apartment in the Jimei suburb of Xiamen city. It’s on the 26th floor with an ocean view. We can afford this on our teaching salary, but the extra income from the copywriting helps us to send money home. Right now, I’m writing this from a café in Wuyi Shan, the famous and stunning mountain resort in the northwest of China’s Fujian province. I have a weekend off from teaching, but still I have some clients with some paid work. I can work in the evenings, which gives me time to explore the mountains and the surrounding villages during the day. Which, of course, gives me material that I can use for our travel blog when we get back. Do You Need to Be Certified, Or Have Any Qualifications? You can make money copywriting on UpWork without any certification. I don’t have anything official yet. But I do have a lot of experience writing fiction, which I use in proposals to help sell myself. Once you have some jobs under your belt, this is shown on your profile and it acts as your certification. All my clients have given me five-star feedback and excellent testimonials, which helps when I want more work. Later, if you decide to build a business outside of UpWork, you can use the testimonials from UpWork and include some of the work you’ve done in your portfolio (make sure you get the client’s permission). One great way to get noticed at the start, is to complete part of the job for the client for free, with every application. Most more experienced freelancers won’t have time to do this, and so a well-tailored writing sample can help give you a competitive edge. Of course, plenty of places on the internet offer training and certification. I’m currently studying for the College of Media and Publishing’s Diploma in Copywriting. I’ve also heard great things about The Blackford Centre’s copywriting course. How Can People Find Copywriting Jobs? You can set up as a freelancer on UpWork in 15 minutes or less, although I do recommend putting in the extra time to make sure your profile is 100% complete. Also, do some research on how to write a strong profile. A quick tip, the best profiles focus on what clients want and how you can help them, not so much on skills and experience (although these do help reassure skeptical clients). After that, it’s a simple matter of using UpWork’s online search engine to find high-quality clients. Then you write a proposal. Again, keep this centered on the client and focus on exactly what you can do to help them. If they like your proposal, they might invite you for an interview, which basically opens an instant messaging feed where you can both discuss the job. After that, they’ll hopefully decide to hire you. Then it’s a simple case of doing the work and submitting it via UpWork to get paid. As you gain experience, you’ll instinctively recognize who is genuine and who is trying to rip you off. Also, try to look for jobs that have specific descriptions, making them much easier to target in your proposal. I recommend for your first few jobs you don’t worry about the pay too much, and keep your hourly rate low. After that, you can raise your hourly rate and take on higher paying jobs. Don’t be afraid to try out lots of different types of jobs so you learn which ones you like best. This will help you to specialize, leading to higher paying jobs in the future. Oh, and remember. Search the whole ‘Writing’ category for copywriting jobs, not just the ‘Copywriting’ subcategory. Many clients only think of copywriting as the salesy stuff. Once you’ve found a job, the first stage is to submit a proposal. You’re up against competition here, but not as much as you might think – many proposals won’t directly address the client’s needs. Instead, write the proposal in a personable tone and directly focus on what the client seems to want – a good job description will reveal this – and how you can help them achieve it. Include a relevant sample with the proposal as well, but don’t spend hours writing it. You only need to showcase your ability to do the job and it pays to be efficient in your application process. Be prepared to take a low pay for your first few jobs and put in 110%. Positive reviews at this stage will pay off in spades. When I started out, I submitted two to three proposals a day and I landed my first job within a couple of days. My first job was editing a client’s covering letter: a few hours’ work for which I was paid $10. But he gave me an incredibly glowing review which helped me land better paid jobs. Also, try to find clients that will send you repeat work. Less time spent sending proposals means more time to make money from these clients. 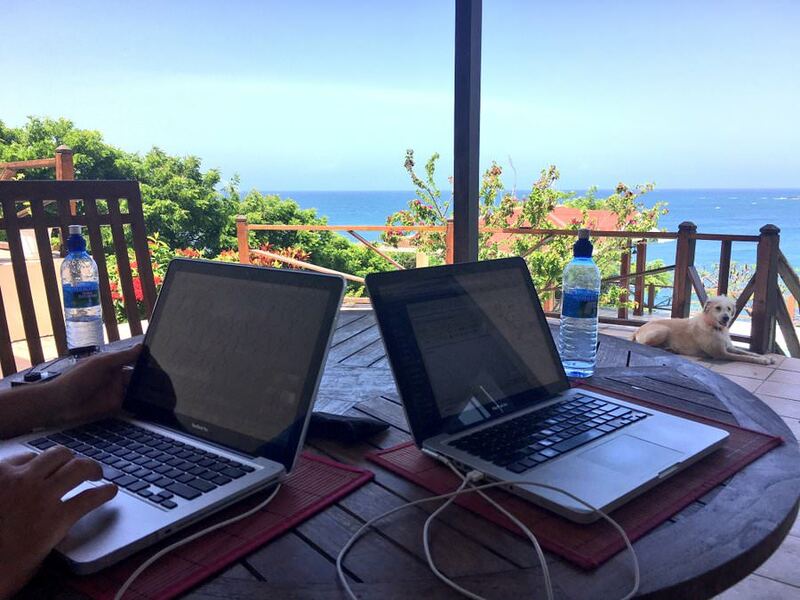 The beauty of working on the internet, is that you can work anywhere in the world. So, you can hop from place to place on a series of tourist visas, house-sitting or short-term letting along the way. If you have a job and working permit in a country you’re unfamiliar with, it’s a good idea to check out that country’s visa requirements. You may have to declare the extra income and pay tax on it. Although, admittedly, many places will have no way of knowing about the extra money you send home. Every digital nomad has the dilemma of where to pay tax. It’s a difficult choice when you earn money in a different country than you reside. The European Baltic country of Estonia have recently set up an e-residency policy designed for digital nomads. It allows you to set up an Estonian bank account and register a business there. I’m considering doing this myself when I go full-time. What Does Working as A Copywriter Entail? Because I’m working part-time on top of teaching schedule, it’s difficult to get into a steady routine. Usually if I teach in the mornings, I do the work in the afternoon. If I teach in the afternoons, I do this work in the morning. When I’m travelling, I’ll see a place during the day and do the work in the evenings. This might include: talking to clients over Skype, submitting proposals, writing first drafts, making edits, researching on the Internet. Because clients could be anywhere in the world, you might have to schedule an interview at 6am or midnight. Full-time, I’d recommend starting the work day with a couple of hours of commissioned work, and then taking time to respond to clients’ needs and send proposals. If you’re organized, I don’t see why you’d need to work more than four hours a day doing this. Particularly if you live in a low-cost location. Even if you only earn $30 per hour, 10 hours per week can go a long way. What Does a Copywriter Get Paid? This depends. There’s copywriters on UpWork that are charging over $100 per hour. Some of these earn six-figure salaries every year. You can earn even more if you take your business off UpWork. I’m working on my own copywriting website right now, but I’ve a long way to go. Many professional freelance copywriters are earning upwards of $1 per word. For a 1,500-word sales letter or white paper, this could fund your travel for a month. If you get good at this, the money is in writing sales letters. I’ve heard of people earning over $50,000 for one sales letter. It’s even possible to get royalties on these, which means big bucks. My latest success on UpWork at the time of writing is for a 250-word Indiegogo video-script at $120. I currently have my hourly rate set as $40 per hour, but in all honestly, I only tend to work fixed price jobs. Of course, you’ll have to start low. Don’t worry if your first job only earns you $5. Ten jobs down the line, you could be charging over $100 for an explainer video script that only takes a couple of hours to write. After that, the sky’s your limit. You can also choose to take fixed-price or hourly jobs. For fixed-price, you agree on a price in advance; for hourly, you log hours using UpWork’s software on the PC. UpWork has protection in place to ensure you get paid. Once the client sends you the offer, they put funds into a dedicated account. UpWork holds onto this until shortly after you submit the work. A word of warning: don’t take on any fixed price contracts unless the contract has been funded. Also, be careful of clients who fund only a tiny amount for the first draft (e.g. $5 of a $50 contract). There’s a good chance they’re operating a scam. Again, it’s up to you. You’ll probably want to put more hours in at the start to help you get established. I recommend setting aside a good three hours, at least, to set up your UpWork profile and make it look professional. After that, you’ll need to spend more time submitting proposals at first. You’ll probably want to negotiate tight deadlines to keep yourself competitive, but be careful you don’t take on more than you can handle. You get to choose your own working conditions this way, so you can work all morning in your pajamas then go out for a run. Or, if you’re a night owl, you can work through to the early hours of morning and then sleep until mid-afternoon. Of course, there are some restraints. If you have clients on the line, they may want to talk to you at certain times. This doesn’t mean you need to be on call 24/7 (unless a specific job requires it). But to stay competitive, it’s a good idea to have some flexibility. As you get more experienced on UpWork, you’ll have more power to set the terms you like. You should also be aware that there are a lot of clients who will try to rip you off. Don’t just look at the money, but the number of hours it might take you as well. It’s also a good idea to consider your rate per word. $1,000 for a 150,000-word novel is probably not worth the time, even when you’re starting out. Unless I’m really low on cash, I personally wouldn’t consider any work under $0.05 US cents per word. Also, note that UpWork takes a cut of your earnings. If you’ve earned under $500 with a client, this is as high as 20%, but drops to 10% for earnings over $500, and again to 5% for earnings over $10,000. So, make sure to factor this into your bids. What Are The Pros & Cons Of Being a Copywriter? The advantages of this kind of work are probably obvious. You can work at home, take the work where you like, you’re not stuck with just one constant salary, and can work harder to make extra money when the funds are low. It’s not something I’d recommend giving up your day job for immediately, though. Get yourself a profile set up first, try your hand at some jobs and see if it can work for you. Once you’re getting clients and repeat business, you can throw in the towel if you like. But the disadvantage of any type of freelancing work is you need to build your own security. So, you don’t just need to earn to pay the bills, but also to build a buffer so you have something to fall back on during the low periods. This isn’t necessarily a bad thing – it just takes a little bit of extra risk-management. But you do have to watch out for scams on the freelance job sites. There’s a lot of people who will try to rip you off. Learning how to filter this out is part of the job. Also, although you do get to interact with clients, the writing itself is (usually) a solitary pursuit. For big projects, this could mean hours of having to sit in a room by yourself, staring at a computer screen. A regular exercise program can help. Personally, my travelling fills the gap. You have to be self-motivated as well. Although you set your own hours, you’re not going to get any money unless you get to the desk and submit proposals or do your commissioned work. It can also be a little disheartening at times. There are days when you’ll have three jobs at once and days where you don’t hear back from any clients and you wonder if you’ll have any more work. I find it helps to grit my teeth and submit more proposals in these circumstances. Finally, you’ll often have to have lots of windows open at once on your computer. So, a fast laptop is a good idea. It can be incredibly stressful when you have money on the line and the computer won’t let you do what you need. Why Do You Love Being a Copywriter? Becoming an UpWork copywriter helped dig us out of difficult times. Suddenly I gained the security that whenever I needed extra money I could submit proposals and get it. The clients have been great as well. I’ve met some interesting people from all over the world and I get a real kick when I receive a glowing review. But most of all, the ability to get paid on the internet has revealed new opportunities. In June, I finish my teaching contract and so I plan to take my copywriting full-time. My wife has been so impressed with my success on UpWork that she’s also decided to try to break in as an Internet Researcher. There really is money to be made on the internet nowadays and now is as a good a time to jump on the bandwagon as any. Any Final Advice For Someone Wanting to Become a Copywriter? I found that a course helped me get started out on UpWork. Danny Margulies’ “Secrets of a Six-Figure UpWorker” worked well for me, but there are less expensive courses out there (though not necessarily the same quality). Also, make sure you have a good internet connection so you can communicate with clients or submit work without a problem. In China, I do recommend using a good VPN. Finally, I can’t restate enough times the importance of putting the client first. I’ve learnt from experience that showing off in my proposals or profile doesn’t pay. What clients really want to know is how you can help them. What a great way to get paid to travel! Check out more inspiration from our other posts below! 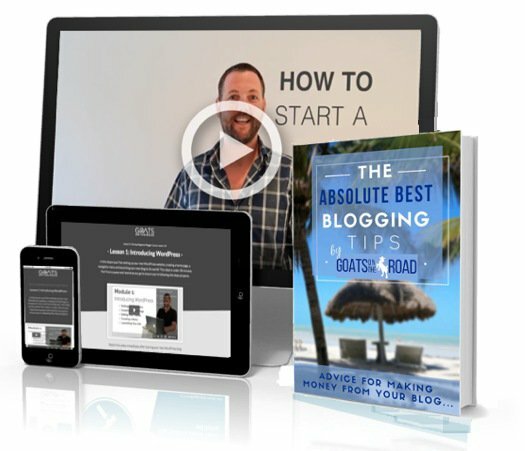 Chris Behrsin is a travel writer, copywriter, and fiction writer who enjoys travelling, writing, reading, and playing the piano (when he has access to one). 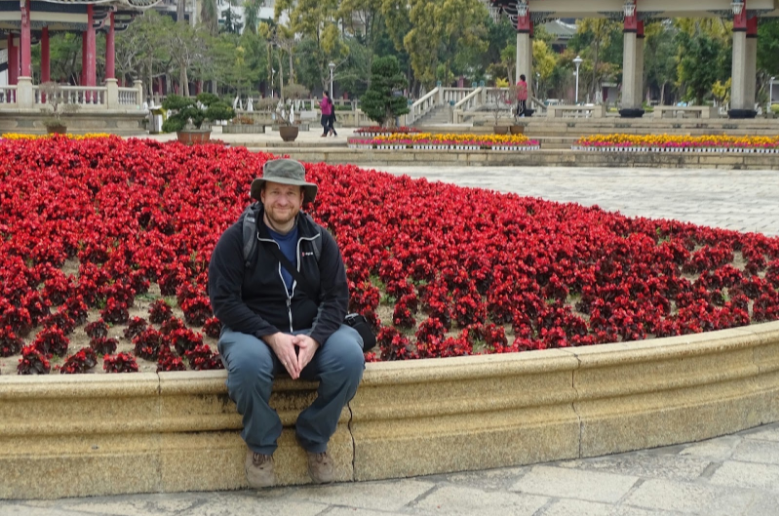 He and his wife run a travel blog where they regularly post travel tips and stories about their travels through China and the world. You can find them at Beinganomad.com. Great article! 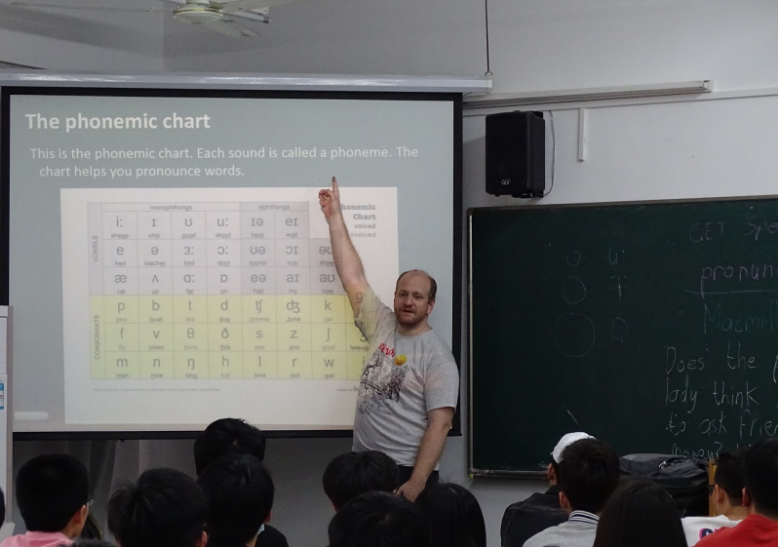 I’m actually finishing my first year of teaching English in China and also use Express VPN. Some great advice here. I’m registered on Freelancer but have heard great things about Upwork. I need to get the ball rolling on it soon, as much as I’d like to rely on my ability to make my blog explode within the year, it doesn’t hurt to have a nice little side-earner! UpWork and Freelancer.com pay rates are, in my experience, simply not up to industry standard. Each has a ton of bargain basement clients hunting for cheap labor. And those clients are often difficult to work with, which further cuts into your hourly rate if you take one of the many “lump sum” jobs. If you’re willing to make just enough to get by, go for it. But if you’re looking to get paid what you’re worth they’re not the way to go. Copywriting is a fairly broad term, and the salary range is also pretty wide.